A year or two ago I was perusing my stitch dictionaries with an eye toward doing something with nupps. I did some swatching, came up with several ideas. Blocked the best of the swatches, then tacked them to the bulletin board in my office where I can look at them every day. And there they sat. I believe that one or two of them were submitted as design ideas to someone or other, but I can’t find evidence of it anywhere. I even lost the charts I’d used. Bother. Well, it’s a good thing that I can usually figure out what I’ve knit by looking at it, because when I saw the call from Twist Collective for the July 2018 issue, I knew immediately what I would be submitting. They liked the idea, too, and so here we are. 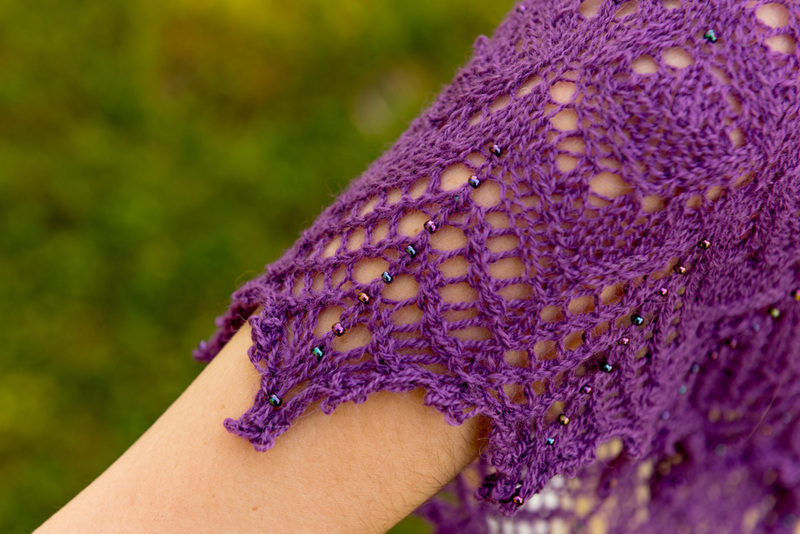 This triangular shawl begins with a cast on of four little stitches. The stitch count increases at the beginning of most right-side rows. Instructions for five sizes are provided for your convenience. Yarn: lace weight; 400, 650 [825, 1050, 1450] yards. Model: Rowan Fine Lace in Twilight Magenta (color number 00952) in third size and Border option 1; 437 yards in 50 grams; 80% alpaca, 20% merino. Gauge: 21 sts and 27 rows to 4 inches (10 cm). Needles: US 4 (3.5 mm) for gauge, and US 13 (.85 mm) for bands. Beads: 100, 125 [150, 175, 200] 8/0 seed beads. Finished sizes: 26 x 43.75, 32.75 x 56.25 [37.25 x 64.5, 42 x 73, 48.75 x 85.25]. Photographs of Bellflower © 2018 Crissy Jarvis.